And that can be, many of this board have at times seen our prospects as much better than they really were, so maybe I am doing that, but... That has happened many times over the last 10 years, but Sanchez is a starting pitcher that throws 100, those guys are rare, rare, rare. That level of stuff with a starting pitcher is just not something you see often, literally the Phillies have never had one. I am a fan of what Alfaro gives you, I think in the not too distant future, if not now teams simply will not run on him at all. His arm isnt just very good, it is in the "could be the strongest in the league" category. He made some throws last year that looked like he was handing it to the 2nd baseman. Realmuto has thrown out 33% of the runners in his career, so he is no slouch, but he isnt going to get better, he is probably soon going to start to get worse. This is the move of a team getting the last piece to put them over the top, we are not that team. I don't know how an all-star who might well be a better overall position player than your entire roster (he may even out-OPS Hoskins once he's out of Marlins Park) can be seen as a "finishing piece." This is a cornerstone player. If anything, my question is if you could do it over again, assuming you're still gonna get one of the FAs, would you still make both the McCutchen and Segura moves? Also, while they merely replaced the RHB Alfaro with the RHB Realmuto, since he could hit higher in the order, does this make Harper more attractive than Machado? Xog and Bkox have the same thinking as i had, for us older fans, not sure of X's or B'x age, but there was so much excitement when the phils signed Parrish. man, what a tremendous disappointment. hopefully this goes much better. Still think matt got fleeced here. we were all worried about that 3 prospect and heaved a sign of relief when stewart was named. but, i don't think Stewart is chopped liver. it will be interesting to see how he develops. i'm surprised they pulled back dohy. I hated to give up Sanchez but I keep thinking back to that article about how teams only trade away top prospects that they've developed questions about. Perhaps the Phillies are no longer comfortable with Sanchez's durability or his work ethic and conditioning needed to make him more durable. We don't know, we shall see. It is interesting how the Phillies suddenly burst back onto the Realmuto scene and how Sanchez suddenly ceased to be untouchable like he was to the Orioles back in July when Machado was on the market. Perhaps they really didn't like what they saw in the current "pre-Spring Training"? Also, we may not end up with any long legacy of the Hamels trade, aside from indirectly Realmuto who we got for Alfaro who, in the end, just turned out to be an "asset". We just may see Hamels return someday with none of the pieces we got for him still here. Eikhoff and Williams are all that are left. But yeah, I could see Realmuto putting up an MVP-calibur season at CBP. He was good. Career rWAR of 23 and 3 seasons 5.0 or better WAR. The best OF the Phillies drafted and developed in quite a long time and the subject of many debates over how the Phillies Dancy complained about Bourn taking too many walks in the minors (despite a .400 OBP) and demanded more power. Keith Law thinks it is a fair return. 2-win upgrade for the major league team, more if he could improve his framing. BTW, NL East should be up next on his prospect reports. Bowden: Grading the Phillies and Marlins on the J.T. Bowden liking the deal has me reconsidering my belief that the Phillies did ok. Idiot. I am with you bkeich. I'm just not a fan of the current approach. 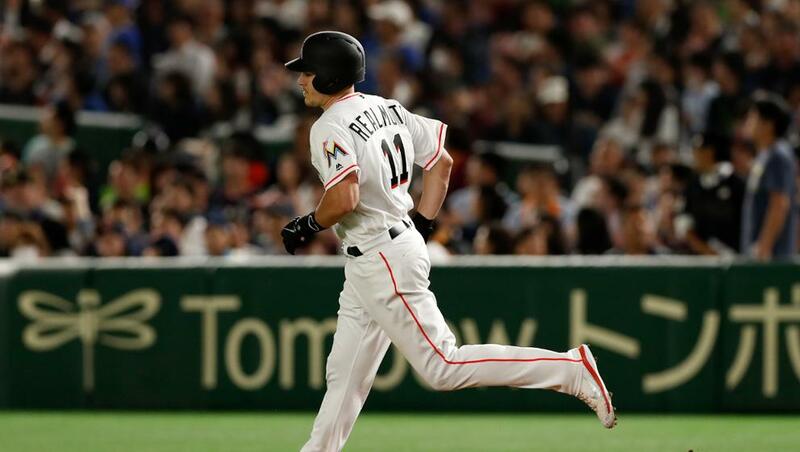 Yes, Realmuto was better, and probably is better, yesterday and today than Alfaro. But over the next six years, if they are at all comparable, we gave up a 103 mph pitcher with control. They don't come along that often. This is my first post. I'm not a confrontational type of guy. These are just my opinions. It seems that this regime is attempting not to develop a team, but purchase it. And the surprise is, they have been doing that since last August, when they had an emerging (but not great) team in first place, they went out a trading for names (yes, names of players they know and think were better). How did that work out? Today, they are doing that again, but with better names. We are turning over a lineup from last August 1 that was in first place, in the hope, that better names make us a first place team. Well, we had one. Yes, I realize not a great team that was probably overachieving. But it was an emerging team. This year's team might be better. It has better names. But past performance does not indicate future performances all the time. It might here. It might not. I'd rather roll with the emerging team, plus added pieces we've now tossed away (Crawford, Sanchez) in the next five years then taking this approach. You can't usually buy chemistry. That August one team had that. One thing I don't think I've seen mentioned anywhere (and apologies if I missed it) is that Realmuto is a contact hitter. One of the big issues this team had last year was while we had real good on base and power skills there were a lot of players LOB when we just needed someone to put the ball in play. 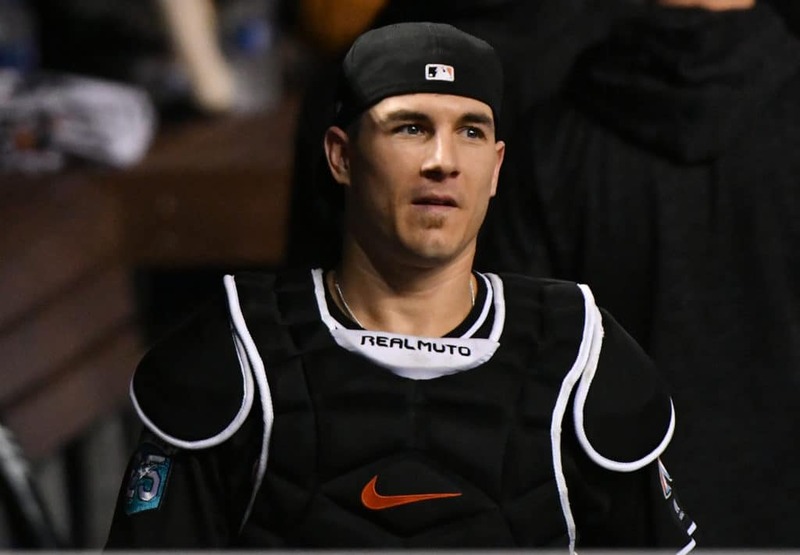 Realmuto is a .280 career hitter and a .309 hitter outside of Miami. Realmuto and Segura might provide some balance to go with the walk heavy OBP of players like Hoskins, Hernandez and McCutchen. Might get banned but I really dislike this trade. Marlins were going to deal him somewhere or have a very unhappy camper. Why give up a younger catcher w upside and our top prospect and another prospect for a .280 hitting catcher. One thing worth noting is Realmuto’s reputation as a good game caller. I think this is another area where he brings improvement over Alfaro. I’m undecided about this trade; if Sanchez had no health questions, I doubt that the Phillies make this trade. Philly is going to love Realmuto! I think that all of us - well, most of us - would have done Alfaro + Miller for Realmuto. It's adding in Sanchez that's giving us pause for concern. So, that begs the question of how we evaluate Sanchez. If you have him as a legit future ace, then you probably don't make the trade. If you have him as a lights out closer, then you may not make the trade. If you think he's either hiding an injury or is about to be injured and set back his development another year, adding him in probably doesn't give you too much pause for concern. At this point, even if the Phillies get one of Harper or Machado, I'd still like to see them get another SP on a short deal - Keuchel on a 2-3 year deal wouldn't be too bad. Welcome Jdp. A lot of the team is home grown, especially the pitching. We've done a lousy job drafting and developing hitters. Who is Miller? Stewart ? Alfaro is 26, he's all potential, but getting old for that, simply lacks the plate discipline to ever be more than a mediocre hitter, Grullon is Alfaro lite at 23 in Lehigh. If we extend Realmuto, huge upgrade until the young catchers arrive (safety in numbers). 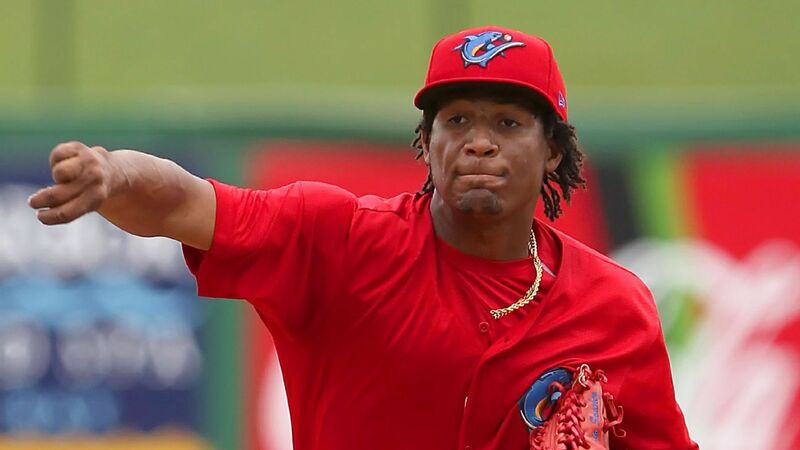 Sanchez is a top prospect, but note that Howard who is only 2 years older also hit 100 and has three pitche, good control and fewer physical questions. They have Medina at AA, Howard at Clearwater and Morales at Lakewood. Stewart is a solid prospect, but we have plenty of LH SP prospects throwing 90-92. It was expensive, but if they extend him for a few years at a reasonable rate, worthwhile. I don't know that I buy the argument that the team chemistry was upset by the acquisition of Cabrera and Ramos (who didn't even play for weeks), though the correlation is certainly there. But the reality is Cabrera was a dud, and the young pitchers regressed to the mean. A lot of the other problems (Hernandez's injury, Franco getting cold again, Hoskins slumping) hurt just as much. And neither Kingery nor Alfaro were producing well enough to be irreplaceable, chemistry or no chemistry. And in hindsight they maybe should have gotten a pitcher (or Machado) instead of Cabrera, but then they wouldn't have had Sixto to deal now. That they acquired Ramos then and Realmuto now tells you they were just never all-in on Alfaro being the guy to both blossom offensively and run the staff. They could easily be wrong. They've been wrong about a lot of things. Although the team played extremely better than expected and was a serious contender for the NL East championship for 2/3 of last season, they did show a serious deficit on defense. IMO, they have greatly improved that defense with the moves made so far this off season. Players such as McCutchen and Realmuto have a record of being good team players and should mold well into the team. I expect that team chemistry will not be a problem in 2019, especially if they can start off winning early. In addition to improved defense, I believe the offense has improved with the changes already made. They have also assembled a nice stable of relievers that should be more effective than the bullpen of last season. I really did not want to trade Sixto and had hopes that he would soon be in the rotation and in a short time become another ace along with Nola. Sadly, if he goes on to that level, it will not be as a Phillie. First Alfaro is 25 till June. Second age is important. Players peak at age 27. He has 2 more years on the upswing and Realmuto could be at the start of a downswing. And you are the only person on the planet who thinks Grullon is anything more than a backup catcher and is probably 50-50 that he gets to that regular role. He is certainly not a reason to feel good about 2 years from now. At that point we'll have to extend an older catcher (Realmuto at 30) or more likely get a stopgap hoping one of the kids in short season develops. There are reasons to like the trade if the goal is to win now. Dismissing Alfaro, already an average major league catcher, as all potential while pointing to Grullon after 2 years are not those reasons. They are reasons to fear the consequences of the trade.